They say cats have nine lives. 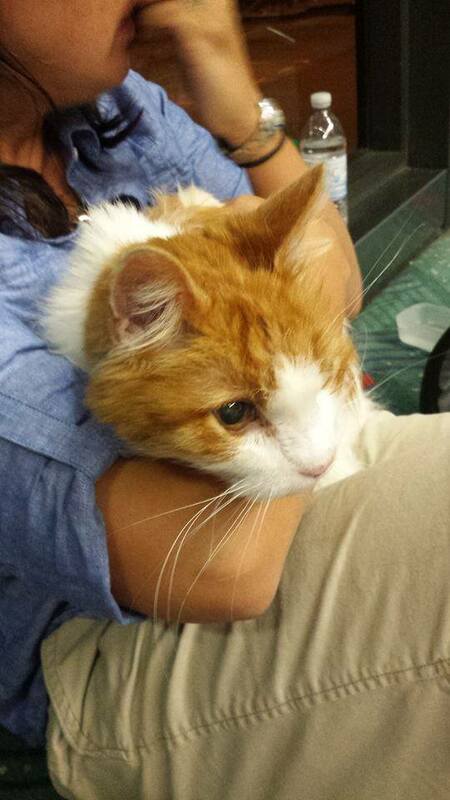 Thanks to Alaska Airlines employee Robin Yong, a cat from West Seattle has all nine intact. Yong heard the tale of Itty Bitty Kitty, a lost cat from West Seattle, via Facebook. Kitty, an older, orange and white tabby, ran away from home as his owners prepared to move from Seattle to Ohio. He missed the trip, slipping away as the car was being loaded. When his owner, Beth Lewis, realized that Itty Bitty was missing, the road trip was postponed as she searched high and low for her beloved pet. But it was during the Fourth of July weekend, and the noise of fireworks likely kept him away. After a two-week delay, and no Kitty, the family made the painful decision to make the trip without him. Several weeks later, a neighbor found the cat and called Kitty Harbor, a Seattle shelter and adoption facility for homeless cats and kittens. Itty Bitty Kitty arrived, looking like a mere shadow of his former self. Before, a plump 14 pounds, he had shrunk to only five pounds, had a gash in his throat, missing teeth and was full of fleas. Kitty Harbor provided medical care and a safe respite, nursing Kitty back to health. Yet, while Lewis was thrilled that their beloved cat was found, she couldn’t drive or fly back to Seattle to get him. And Kitty couldn’t fly as cargo, due to his health. That’s when Yong, a Seattle-based employee, jumped in. Being a cat-lover herself, Yong offered to transport the cat. In an outpouring of feline love, others from the area offered their support as well. Via Facebook, someone said their husband was going to Indianapolis and could take the cat. Another offered to get him half-way, to Oklahoma. In all, there were 10 offers of travel for Kitty, but Yong was able to do it that weekend. So she contacted Kitty Harbor Aug. 1, and arranged the trip. Learn more about traveling with pets. Yong looked at it as an opportunity. Itty Bitty Kitty waits to board an Alaska Airlines flight to Chicago. “We hadn’t seen Chicago yet, so I thought, why not? We can help out, and see the sights at the same time,” Yong said. Joined by her spouse, Jane, they took the red-eye, luckily getting the last two seats on the plane. Yong arrived in Chicago just after dawn, rented a car, and drove two and a half hours to Lafayette, Indiana. Lewis drove two hours as well from Dayton, Ohio. There, Yong turned Itty Bitty Kitty over to Lewis, who, on seeing how much weight he had lost, was on the verge of tears. “Robin was incredible. She was just an angel for doing this. I can’t even find the words to thank her enough,” said Lewis. After that, Yong returned to Chicago and did a bit of sightseeing before catching a flight home the next morning. 2 comments on "Kitty hitchhiker gets a ride thanks to Facebook, Alaska employee"
Thank you, Ms. Yong and Kitty Harbor. Meow meow purr purr from Lulu =^••^= to Itty Bitty Kitty. I just want to say how moved I was to hear how Robin Yong not only went out of her way to reunite Kitty and her owner in another state, but that she did it so selflessly. It’s heartwarming to know that she and others cared enough to help this poor lost, sick, injured animal be returned to her devastated owner, who probably thought she would never see her Itty Bitty Kitty again. Thank you. I don’t know any of the people involved, but I know how I would feed if my Sweetpea and I were separated and I thought I’d never see her again, and then complete strangers helped us find each other. With all the daily news of horrible people doing horrible things to other people and helpless animals, it’s wonderful to see a story of human kindness like this.